Lady Henterman’s Wardrobe is the second in Marshall Ryan Maresca’s “The Streets of Maradaine” sequence, the first of which I thoroughly enjoyed reading last year. There’s a larger Maradaine universe being explored in other sequences, including youthful and magical vigilantes, and Holmesian mage-detectives, but this sequence focuses on the Rynax brothers, who have a penchant for elaborate heists, a number of slightly strange friends with specialist skills, and a serious desire to find out who burnt down their neighbourhood, in order to express their disapproval. The city of Maradaine has always seemed like another character in these books, putting different aspects of itself on display, depending on which characters were looking at it. Here, we see both the more run down, un-examined parts of the city, where law enforcement treads quietly, carefully, or in large numbers – and parts prone to the roaring revels of the wealthy, where private guards make sure that nobody who isn’t there to cause the correct kind of trouble is let through the door. The first of these is epitomised in the lively neighbourhood where the Rynax brothers make their home. It has several excellent craftspeople, and a sense of community. There’s a history there, across generations, and a sense of people looking out for each other. If the law is far away, the local criminal element operates within rules, operates with respect, and knows where to push and put its boundaries. It’s a place where being an outsider could get you a knife in the kindeys, sure, and one where a moments inattention might lead to a broken head, but where reputation is everything, good and bad. By contrast, the opulent manors of the rich are a baroque haven, full of enough glinting gild to satiate even the most demanding magpie. These are people happy to stand on the shoulders of others to get where they are – or, if necessary, hold the heads of others under water. Security’s tight, and the spaces are vast – if not overly populated by anyone with much sense of responsibility. That said, the owners are at the top of the socio-economic heap, and they’re certainly willing to keep it that way. Which brings us to the characters. The Rynax boys are still as wonderfully drawn and complex as ever. One suffering the after effects of a covert operation gone wrong, the other happy to try and build a respectable life and a respectable family – but both determined to track down the cause of their woes. It’s great to see the edges here – there’s someone who might have been an action/anti-hero in another story, struggling with life after being shattered and rebuilt. Then there’s his brother, who is genuinely happy not being the hero of the week, and just wants to settle down, make interesting mechanisms, and have a quiet life with his family. They’re not stereotypical heroes, but they do act as very relatable people, shaped by their experiences, and living with the consequences of their choices. They’re joined by a thoroughly enjoyable cast of other reprobates. I particularly enjoy the hard-edged markswoman with a penchant for precision and a small crush on the married Rynax, and the street girl who has started to take the children of the streets and make them her own, lending them her own strength when necessary, and pushing forward in an effort to be something more. There’s a delightful bevy of dubious coves as well. 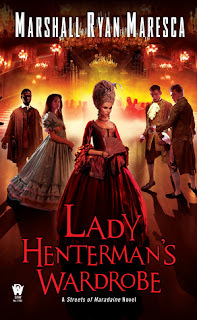 The eponymous Lady Henterman is smooth and cold as ice, definitely someone worth watching. There’s the mysterious gang leader moving in o n the formerly safe territory occupied by the Rynax twins, with his programme of extortion and brutality. There’s Lord Henterman, a man almost frighteningly vague. And, of course, there’s the police – no fan of people they consider nuisances at best, and outright dangerous at worst. Whether some of these erstwhile antagonists are actually bad people is open to debate, which is a nice change – they may just be working their own agenda, without the necessity of malevolence. But there’s some wonderful diversity and personality on display here, and watching them face off against our protagonists was always delightful. Plot-wise – well, I won’t say much, for fear of spoilers. The Rynax brothers are known for their heists, and this is definitely a story of a plan which needs split second precision, and the ability to react properly when…er..I mean if…it all goes wrong. There’s some wonderful moments where your expectations are subverted, and some wonderful duels, the kind where wit and blade matter as much as each other. There’s some reasl emotional heft in the dialogue between the Rynax gang, and a sense that they’re starting to look forward, and out of their current circumstances. There’s also the white knuckle, every-second-counts high-wire tension, of course, and some revelations that will hit hard, down in the gut. It’s a heist story, an adventure story. A story about family, about friendship, about betrayal, murder, and making a heap of money. It’s fast paced, it’s smart, it made me laugh aloud more than once, and it also kicked me right in the feels more than once. 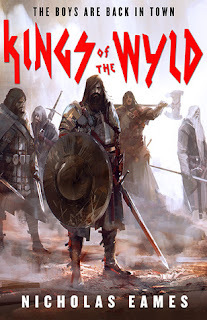 This is kick-arse fantasy, and if you’ve been waiting to find out what the Rynax brothers did next, or you’ve always wondered how a fantasy heist would go down, this one’s worth checking out. Kings of the Wyld is the debut fantasy novel from Nicholas Eames. In a world ravaged by monsters, the mercenary bands who combat them are treated like rock stars. Some of them do it for the money. Others do it for the fame. And a band which rocked the foundations of the world is being drawn back together for one last gig. The world s one split between the urban and rural. In the urban we have walled cities, towering monuments to ingenuity and skill. That they have rather thick walls is surely incidental. This is a civilisation based on the ruins of others – a near immortal race of bunny-eared savants put down the roots of the modern society, before their brutal annihilation in mysterious conflicts of the distant past. Their artefacts are as powerful as they are mysterious – which is to say, very. Still, it’s a land almost at peace. The vast and monstrous hordes of decades past have been broken by bands of mercenaries, mixing magic, swagger and violence together in an intoxicating blend that is almost, but not quite, heroism. This is a land not fit for heroes. But something is stirring, and this precision-crafted world provides a vivid and detailed backdrop for the machinations of the characters. The band are a diverse bunch. They’re a mix of sociopaths restrained by their better natures, and/or those who use monster-hunting as an outlet for their violent urges, glory-seekers, money-grubbers and those who might be charitably described as a little unstable. They’re also experienced, or, if one is feeling less polite, middle aged. This band of hardened killers has stories written about them, and once shook the world – but they’ve broken up, settled down, and found their own causes; their reputation maintained by an audience which is now itself older, while newer, cooler bands capture the hearts of the young. Somewhere in there is a commentary on playing to large arenas for the love of the crowd, as opposed to the older craft of trudging around the country and working smaller venues in your murder of monstrosities. In any event, The Band are not, in a lot of ways, nice people. But mellowed, or possibly even broken, by their age and having survived everything that life threw at them, they’re amazing to read about. Gabe, the charismatic, subversive face of the band, if not the leader, is a wreck held together by love for his daughter. Their rogue is deadly with knives and lockpicks, but also suffers from having everything he’s ever wanted. The shield-man, our protagonist, manages to restrain his own penchant for brutal violence with the totem of his family, and his love of the rest of the band. This is a group of tired individuals, gone somewhat to seed; but if their past is now behind them, they still have the energy, the raw potential, to make things change. The chemistry between them is palpable, and the relationships they construct, or the histories that they carry with them are subtle, human things, which put wounds, scars and faces to the characters, and give them a certain depth and heart. The plot – well, at base, it’s a journey. Physically, yes, as the band reforms and marches across the world in service to a larger goal. And that’s a rip-roaring adventure for sure, with political machinations, horrific monstrosities, kinetic combat and an emotional heart which hasthe potential to rip you open at the same time as it promises cathartic resolution. It’s gloriously bloody, honest stuff, which has a core of humanity which makes it affecting and real. But that’s the thing – alongside the physical journey, the swordfights, the daring escapes, the complaints about old injuries, there’s the personal journey as well. This is a band not entirely prone to self reflection, coming to terms with their own past, and the realisation that the tarnished images they built for themselves in their youth have been largely forgotten, feet of clay and all. This is a journey which challenges assumptions, and explores the ties that bind a group together – loyalty, truth, and the desire to make a lot of money. It's an absolutely cracking debut, and one I recommend unreservedly. Give it a try. Blood of Assassins is the second in R.J. Barker’s “The Wounded Kingdom” series. It follows Girton, sometime trainee assassin, sometime artiste, and occasional killer, as he investigates treachery, mendacity, magic, and the occasional murder, in a land broken by malevolent sorcery and internecine warfare. The Girton of this story is one scarred by war. He’s spent the last few years out on the borders, fighting for pay. We last saw him as a damaged youth, but this is a man who has internalised his own wounds, then coated them over with armour, both metaphorical and physical. The agile sweeps of an assassin’s knives have been put away, and a Warhammer taken up instead. It’s a brute thing, an engine of war which breaks what it touches – and in that choice, the reader can see some of the struggle that Girton has internalised. There’s a rage bubbling up in there, and a sense of the cost of both fighting and running away. He travels with the woman who raised him, his Master, a woman whose unspeakable lethality is matched by a closely held affection for Girton. Their relationship has weathered storms, and the warmth of the complex bond between the two is a joy to behold. That Girton may feel a certain possessiveness makes sense; this relationship, almost parent-and-child, is the one point of stability in a life of disguise, double-bluff and murder. But the text lets him face up to the ugliness of that possessiveness, and isn’t afraid to explore the emotional landscape of the boy-becoming a man. In a life seemingly lacking much non-mentor affection, Girton is emotionally vulnerable, no matter the armour he wears, physical and mental. The loyalty and love Girton has for his master is the emotional heart of the text – or at least one of the lungs; the other is Girton’s relationship to Rufra, perhaps the only friend he has, now a king fighting a war for the throne. Rufra and Girton work well together because of their history. They’re two boys who fought their way out of something terrible, and have grown into men trying to do the same. Rufra struggles with the demands of kingship – with being a good and just king, with the harsh realities of statecraft, and with balancing those against his own needs. Girton’s return, a reminder of a simpler time, may help him claw back some of the sense of self which being a leader, being a figurehead, takes away. The dialogue between the two, from angry words through to silent affirmations of friendship, is pitch perfect, and emotional depths are quietly and breathtakingly plumbed. This is a book which carries the weight of hurt and fire white hot rage in its prose, and leavens it with an intimacy and humanity which makes it impossible to put down. Girton is, of course, drawn into the madness of the struggle for the kingdom of Maniyadoc, land already broken and poisoned by sorcery. The atmosphere is one of conflict, of broken bodies and broken promises, where the social bonds that keep everything together have begun to fray – or, in some cases, been deliberately snapped. Maniyadoc continues to fascinate, as the social hierarchy - set in stone by the apparent death of their divinities – begins to disintegrate. The upheaval is not just political, but social, and you can see that in every common soldier starting to think that maybe the knights up on their horses don’t have any idea how to lead. Or in the new wave of priests quietly preaching the ideas of change. Or in the way the Landsmen, killers of magic users, willing to use their blood to return a land to life, will stand aside whilst the political uncertainties wear themselves out. This is a land in flux and crisis, without question, and one where the battles, where the knives in the dark and the swords on the field all come within the wider tapestry of compelling world-building. The plot? Well, it’s intriguing stuff. 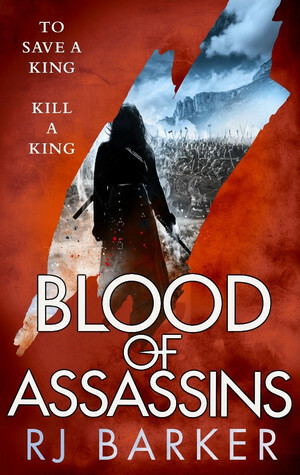 Girton investigates a plot to kill a king, and win a throne. There’s espionage. Counter espionage. Betrayals. There’s love, for family and romantically thrown into the mix. There’s a lot of assumptions that get put on display and torn down, as the world rearranges itself over the course of the story. This is a story of mystery and murder, more than a whiff of LeCarré mixed into the cavalry charges and politicking. There’s blood, for sure, and sacrifice, and a feeling of costs and consequences for every inch of progress – and there’s some wonderfully human moments in the mix, and opportunities to grasp a little light and hope in the maelstrom. The scheming is suitably byzantine, the stakes both immediate and personal -the story, spellbinding. If you’ve made it this far, and you want to know if this sequel is worth it, take away an emphatic yes. It’s definitely worth picking this one up. 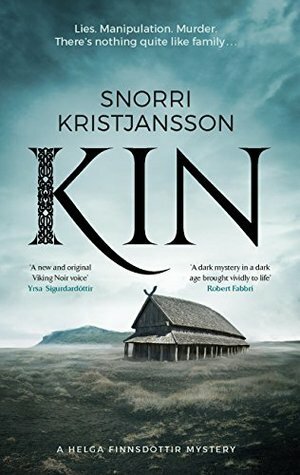 Kin, from Snorri Kristjansson is a story of family, and what ties them together. Old grudges and old wounds, for certain, and if they’re bound by blood, that blood can also be spilled. It’s a detective story set in the era of Viking raiders, one where a glowering sky enfolds a group as much in bloody thrall to their pasts as enraptured by family affection. If the combination of Vikings, mystery and murder sound good, then this is the book for you. This is a starker world, one where a household is one of the core units, where what can be farmed is the limit of one’s landholding. Kristjansson evokes the atmosphere of the period with remarkable skill. The crystal blue skies, the sense of isolation, the mixture of self-reliance and reliance on the settlement group. The farmland sits in a wider landscape with a stark beauty, giving a unique blend of humanity and wilderness at a time when that demarcation wasn’t yet fully realised. There’s a wonderful liminality to the setting as well; the Gods of the Norse have a presence here which is almost physical, their existence felt and accepted, if never entirely seen. The role of religion, of faith, is expored somewhat here as well – as a driver for peoples motivations, as a means of social control, and in its own purity and simplicity. Whether or not the Gods are real, this is a world which accepts that they are, and that acceptance permeates the thoughts and actions of the characters. And what characters they are. Our focus is Helga Finnsdottir, the incisive ward of the Reginsson family. Helga is clever, certainly, but also capable of being smoothly charming and acting quickly. She carries some insecurities around her own position in the family, and those facets of self doubt are ones the text doesn’t shy away from. But she’s a solid investigator, one with an interest in the truth, even as she starts digging into family secrets. If Helga isn’t all sweetness and light, she’s certainly forceful enough to carry the reader along with her, and her own weaknesses are ones it’s easy to empathise with. One of the strands explored in the text is that of agency – as women, Helga and her female relatives could have been seen as marginalised, but here they’re a very active part of the family; while Helga carries some of the aura of an outsider, not tied to the family by bonds of blood, her adopted mother is a force of nature, one always able to achieve her goals through putting the right word in the right ear, through shared history or careful construction of narrative. That soft power is backed up by Reginsson, an ex-raider, now aging but still powerful in his own raw physicality. The Reginsson partnership is one of the highlights of the text – a match which clearly has decades of affection behind it, alongside a clarity born of experience, and a ruthlessness likewise. But there’s a swarm of other characters here as well, as the Reginsson family comes together. The raiding son, with an eye for wine and another for women. The second son, a tower of a man with old wounds from his brother. The third son, a farmer, who may be carrying his own demons. The daughter, a vicious fighter with schemes of her own (and a husband from as far away as Sweden!). The Reginsson children are a complex bunch of marauders, and there’s always a sense - in the dialogue, in the way they pass each other mead, in who goes to do chores with whom - that they have their own agendas at play. Once the initial barrage of names is over, they swiftly grow their own personalities, sympathetic and otherwise, stepping out of our cultural preconceptions of the period to become living, breathing, scheming, stabbing, screaming, plotting, charming, friendly, murderous people. To be honest, I would have been happy with Kin if it had just been a memoir of the Norse. The family dynamics, the close knit, often tense, occasionally poisonous relationships wrapped inside bonds of blood and affection make this an absolutely cracking family drama. But it’s a murder mystery too. For the sake of spoilers, I won’t say any more – but the mystery is carefully constructed and plausible, and the resolution reasonable, with a solid emotional payoff. It’s the relationships between characters which make the stakes, and make the situation feel real – and they’re top-notch. Somewhere in the dizzying spirals of ties between families is a killer, but quite who it is – in a world where violence floats close to the surface – is another question. Anyway, Kin. Do you want to read it? The pagan Norse period may not be for everyone, but here it’s given surpassing depth and integrity. The characters are complex and believable, and the central mystery one which rewards careful reading – and working it out alongside Helga was great fun. If you’re in a Scandi-noir mood, and willing to leap back through the centuries, then this is a book which will reward a reading; I, for one, look forward to the further adventures of Helga Finnsdottir.